Any discussion about decline in the US should look to Britain for historical guidance. Like the US, Britain started from a position of technological leadership and absolute economic preeminence. As the technologies diffused, it was doomed by its small population to relative decline. Even if it had maintained its leadership in terms of income per capita, its total GDP would inevitably be eclipsed by GDP in US, just at GDP in the US will surely be surpassed by GDP in China. Britain has, nevertheless, remained a world leader. It has an asset that GDP can’t buy. Gordon Brown once observed that in establishing the rule of law, the first five centuries are always the hardest. Does this mean that each country follow this same slow path? Of course not. The Privy Council now acts as the court of appeal for many nations in Ready to take the next step? Get free insurance health insurance quotes or find an agent near you. the Commonwealth. They retain local executive dgfev online casino and legislative capacities, even their existing legal traditions. But through this arrangement, younger nations get instant access to a credible form of judicial independence. The new debate in Britain asks whether this arrangement could voluntarily be extended beyond the Commonwealth. See, for example, the discussion about Honduras’ preparation to send appeals to the Privy Council. This debate has opened up because of efforts in Honduras to develop a new city-scale reform zone. (For more on this strategy, as highlighted in Brandon Fuller’s recent post.) The conjecture is that Britain could encourage in other places the kind of development that it spurred in Asia by fostering an outpost of British law in Hong Kong. If, indeed, the rule of law is among the most important human inventions, the UK could continue to exert for decades — perhaps forever — an outsized influence on world affairs. All it needs to do is keep encouraging the spread of its most important invention. Paul Romer is Professor of Economics at New York University’s Stern School of Business and Director of its Urbanization Project. The Urbanization Project addresses a truly historic challenge and opportunity: welcoming an additional 3 – 5 billion people to urban life in less than a century. So far, this week’s blog has featured discussions of overall urbanization dyanmics and their potential economic and national security (part 1 and part 2) implications. Now we turn to governance. Humanity’s rapid movement to cities in the coming two decades will inevitably challenge governance structures around the world. These three contributions share a commimtent to this foundational conclusion, but they then derive from it different possible futures. In “Citizens of Cities Not Nations – Implications of an Urban World for Government,” Jonathan Woetzel of McKinsey & Company and Co-Chair of the Urban China casino online Initiative suggests that our primary political identities may shift from nation states to our cities. In “Urbanization as Opportunity,” Brandon Fuller of the NYU Stern Urbanization Project offers an optimistic image of cities’ future through successful urban planning. In “Urban Growth, Inequality, and Telecommuting,” Xenia Dormandy of Chatham House highlights the importance of inequality — and perceived inquality — between and within countres for future governance. If Jacobs was right, and there’s good reason to believe that she was, the world in 2030 stands to be a much better place. According to UN estimates, the urban share of the world’s population will grow from just over 50 percent in 2010 to 60 percent in 2030. The vast majority of this urbanization will occur in the developing world, where urban areas are expected to add another 1.3 billion people by 2030. There are two ways to accommodate this influx of urban residents: expand existing cities or build new ones. In both cases, weak and ineffective governance poses a significant challenge to successful urbanization. 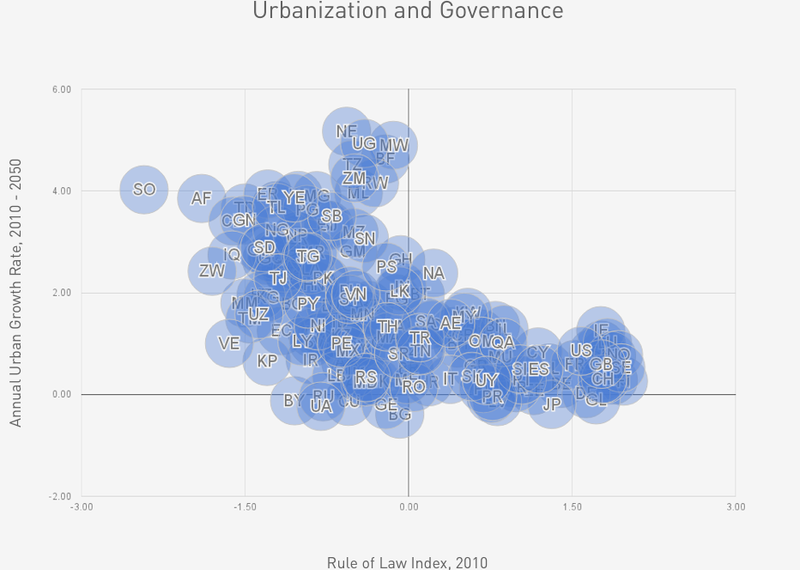 The graph below shows the negative relationship between a country’s score on the Rule of Law Index and its expected average annual rate of urban growth over the next four decades. At the NYU Stern Urbanization Project (UP), we’re focused on urban growth strategies that account for the conditions of governance in the developing world. One initiative, led by Paul Romer, focuses on new cities — particularly the potential for new cities to advance reform and improve choices for urban migrants. Another initiative, led by Solly Angel, focuses on urban expansion. With growing numbers of urban migrants, the physical expansion of developing world cities is inevitable. If incomes continue to rise relative to transport costs, the trend toward expansion will be even stronger. Such expansion needn’t be unsustainable. Because urban densities in the developing world are more than double those of Europe and Japan, they can decline considerably without inducing the sorts of suburban sprawl associated with land-rich developed countries like the United States. Cities in developing countries should come to terms with urban expansion. Ignoring it won’t stop it. People will continue to arrive in an uncoordinated fashion, excluded from the formal sector and consigned to congested slums. Some planning will be necessary. But given the massive scale of urbanization and the governance constraints that characterize much of the developing world, overly intricate planning efforts may be just as likely to fail as no plan at all. UP advocates for a lighter touch approach, one in which governments consolidate land for public space and arterial roads based on realistic forecasts of urban expansion. This approach ensures corridors for public service provision and effectively coordinates the private decisions that comprise the majority of urban development. By spacing arterial roads 1 kilometer apart the city can make public transport accessible to everyone; by making room for expansion the city can ensure that the supply of housing remains ample and affordable. Political risk in the developing world remains a key bottleneck to what would otherwise be relatively high-return investments in urban infrastructure. Policy innovations that mitigate political risk can channel enormous amounts of foreign investment into rapidly growing cities; investments that would in turn offer billions of people opportunities to work their way out of poverty. UP believes that charter cities—new cities built casino online in special reform zones—offer a promising way to mitigate political risk and drive reform in the developing world. The first country to adapt the charter cities concept to its development strategy was Honduras, a country whose urban population is expected to more than double in the next few decades. Seeing this urbanization as an opportunity for reform, the Honduran government established a new legal entity known locally as la Región Especial de Desarrollo (RED). Though part of sovereign Honduran territory, the RED will be largely autonomous. Critically, the RED will also have the power to partner with credible foreign allies, such as Canada and Mauritius, on core government functions including policing, jurisprudence, and a range of public service provision. Such partnerships can strengthen the rule of law in the RED, attracting investors, generating jobs, and providing safe new options for the millions of people in the region who currently lack them. The Honduran government believes that reform in the RED can complement the process of reform and reconciliation elsewhere in the country. Looking forward to 2030, UP is optimistic about the prospects for urbanization to enhance global stability and buoy trade and investment flows. We believe that inclusive urban planning strategies, grounded in the understanding that urban expansion is inevitable, are more likely to result in cities that are accessible, affordable, and peaceful. We also believe that new cities, based on innovative models of international cooperation, have an important role to play in driving reform, unlocking high-return investment opportunities, and improving the choices of urban migrants. Brandon Fuller is a Research Scholar with the NYU Stern Urbanization Project. In “Fighting in the New World: What Urbanization Means for Military Planners,” Janine Davidson of George Mason University explores the implications of the new urbanization for future war planning. In “Urbanization, Security and Resiliency,” Nancy Brune of the Center for a New American Security argues that urban infrastructure planning, investments, and management should matter to national security experts. When combined with yesterday’s contributions, these posts on urbanization and national security offer a series of provocative insights and suggestions that all strategists should consider.